Surcharges will be applied on Special Occasions (New Year Eve, Lunar New Year, Christmas) and other New Zealand’s Holidays. Specially from 23 December, 2017 to 10 January, 2018 and from 16 Feb 2018 to 25 February, 2018. ACCOMMODATION BASED ON THE FOLLOWING OR SIMILAR HOTELS BOOKED WITHIN 30 DAYS OF TOUR ARRIVAL IN NEW ZEALAND AND ARE SUBJECT TO AVAILABILITY. Pick up by Great Sights coach and cross the rich Waikato farmland for Waitomo. Enjoy a guided tour of the Waitomo Caves and a short boat ride through the famous Glow-Worm grotto. See twinkling lights emitting from the ceiling like stars in a dark night. Then continue journey to the thermal resort of Rotorua. Join SIC coach for morning tour of Rotorua’s top attractions – Rainbow Spring to see wildlife and trout swimming in crystal clear water, enjoy an entertaining farm show at Agrodome highlighting sheep farming industry with sheep shearing demonstration. At TePuia Thermal Reserve., you will see boiling mud pools and the mighty Pohutu geyser. Be enthralled by the Maori culture of wood carving, flax weaving demonstration and the replicas of the Maori buildings here. Other sights in Rotorua include the lakeside boulevard and the iconic Government Gardens. In the afternoon on board the coach as we cross the Central North Island – and enter Middle-earth! 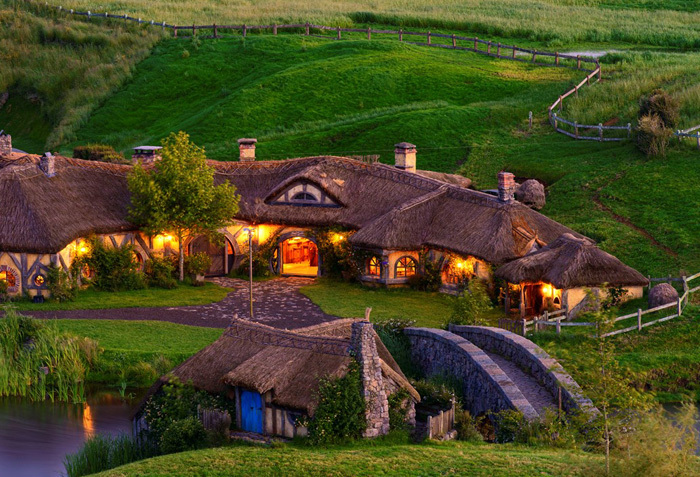 Just outside the rural township of Matamata is the private farm that was transformed into The Shire for Sir Peter Jackson's The Lord of the Rings and The Hobbit trilogies. Join SIC coach service for journey to Taupo, travel along the shore of the huge lake to spectacular Tongariro National Park comprising of massive active volcanoes and site of North Island’s ski fields. From the barren land of this plateau, you descend to the “Capital City”. Arrive Wellington by early evening. Early morning transfer to the ferry terminal to board the Inter-Islander ferry to Picton. The 3 hour’s cruise crosses The Cook Strait separating the two islands and along the serene and picturesque Queen Charlotte Sound. The sparkling waters and lush forest is a breathtaking introduction to the South Island. Connect the SIC coach Service for journey across the famed Marlborough wine fields and along the narrow strip of land flanked by the Pacific Ocean and the Kaikoura ranges which plunges into its water. Lush beauty of farmlands followed before arriving into Christchurch in the evening. Join SIC coach for journey across Canterbury Plains and climb the mountains to picturesque Lake Tekapo. Take in the view of the stone church and Sheep Dog Monument set against the backdrop of the alpine range beyond. Continue across rabbit ravaged Mackenzie Country and scenic Lindis Pass to arrive Queenstown late afternoon. Today enjoy a day excursion by SIC coach to Milford Sound. Follow the Lake Wakatipu to Lumsden and then onward to Lake TeAnau. Enter Fiordland National Park along Eglington Valley and travel through Homer Tunnel to reach Milford Sounds. This is reputed as the prettiest drive in the country with amazing mountain scenery all the way. Enjoy the cruise on the spectacular world famous fiords dominated by Mitre Peak and Bowen Falls. Retrace the journey back to Queenstown in the evening. Enjoy a free day in Queenstown. Apart from beautiful scenery surrounding the resort, this is also the capital of adventure tourism. Why not try thrilling jet-boating or heart-stopping bungy jump? A gondola rides up Bob’s Peak for panoramic view couple with a luge ride is recommended. Or simply relax and enjoy the scenery. Pick up by SIC coach and travel through the Central Otago region and on to Twizel. Follow the shores of Lake Pukaki to Mount Cook National Park Village. Set at the foothill of the Southern Alps, you have a close up view of Mt Cook – New Zealand’s highest mountain. Visit the Church of the Good Shepherd at Lake Tekapo before travelling across the Canterbury Plains to arrive Christchurch in the evening. Meals and attractions as specified . Optional tours and activities not mentioned on the brief itinerary.